On a Friday, not long ago, it was very, very cold outside. In the morning when I got ready for work and begrudgingly walked out the front door to warm up my car, the temperature was -7. Brrr….. So, after work, the boyfriend and I decided we needed something easy to make to warm us up. There was a hockey game on that night, too. 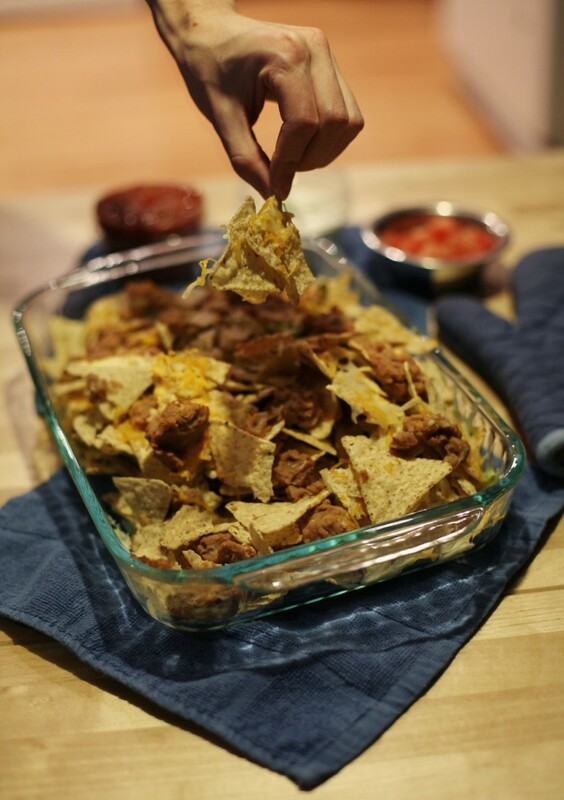 Nachos + Weekend = Happy People. 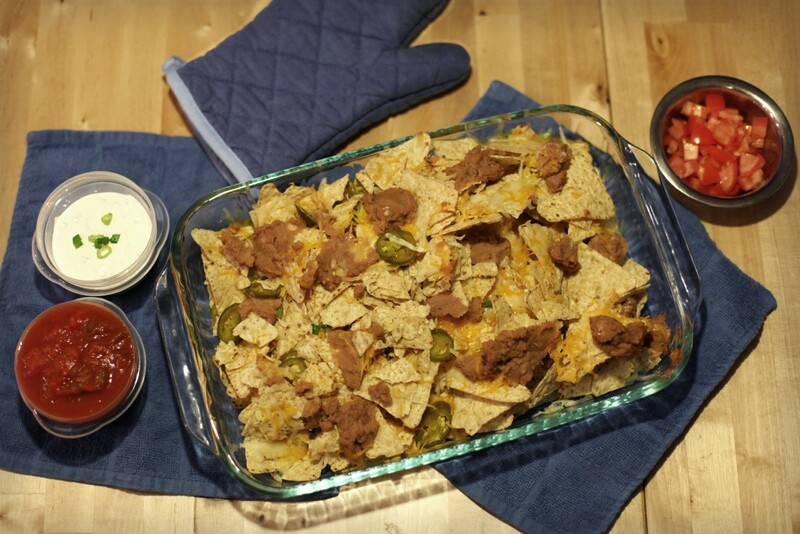 Crunchy, warm, spicy and delicious nachos; especially good on those cold winter months or on game day. Pre-heat the oven at 250 degrees. In a 8x8 (or larger) cake pan (or plexiglass) bakeware make a thin layer of re-fried beans using a spoon. Spoon out enough to make a half inch layer. Add another layer on top of salsa. Make it as thick as you want. 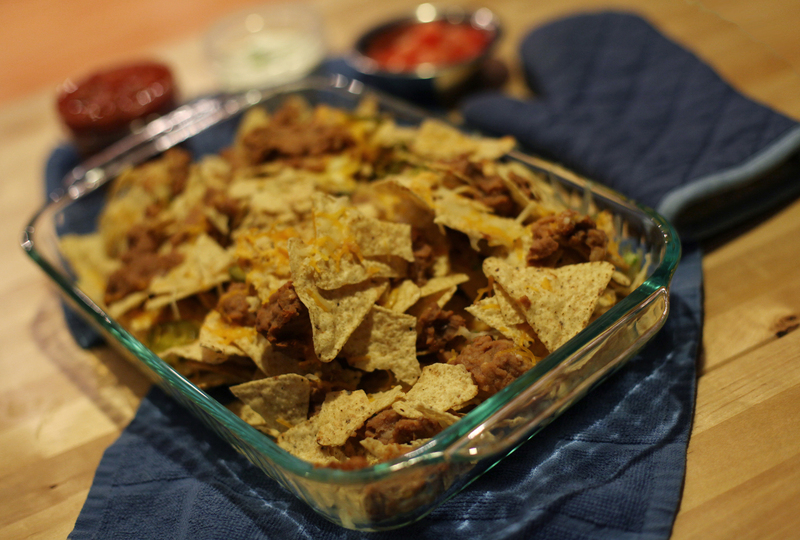 Poor in tortilla chips to make another layer. On top of the chips sprinkle a handful of shredded cheese. Add two teaspoons of chopped green onion. Add 2 teaspoons of chopped garlic. Lay spoonfuls of re-fried beans on top, in a sporadic manner. Add another layer of chips. Top it off with a handful of shredded cheese. Place in middle of oven. Bake for 10-15 minutes, or until cheese has melted. In a separate, small bowl. Combine sour cream and green onion. Stir and use this as chip dip. Remove from oven and let cool for 5-10 minutes. Once cooled, dig in!